Here’s the steps I followed to install Apache web server on Windows 7 with php. I have been running an application on a Windows XP PC for years. The application was web enabled on top of Apache for Windows. This note captures the steps to move my application over to my Win7 PC; since I’ve done this before, this should be easy. Well no, I had some bumps and these notes are to help me for next time. For starters, I decided to follow the nice how-to found at Badprog. For Network Domain, I entered my domain name. AuthUserFile "C:/Program Files (x86)/Apache Software Foundation/Apache2.2/conf/.htpasswd"
Remember: restart httpd with “Run as Administrator” !! Whenever the httpd.conf file is changed you need to restart the Apache web server. 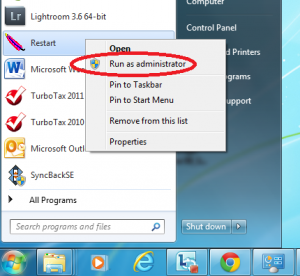 Just selecting and running Restart doesn’t work, except if you run it as an Administrator. From the Start menu, find Restart, the right-mouse click it, and select “Run as Administrator.” It took me two hours to figure this out. Since my old installation was on Windows XP, I never had this issue. SSLCertificateFile "C:/Program Files (x86)/Apache Software Foundation/Apache2.2/conf/cisco163_kozikfamily_net.crt"
SSLCertificateKeyFile "C:/Program Files (x86)/Apache Software Foundation/Apache2.2/conf/cisco163.kozikfamily.net.key"
SSLCertificateChainFile "C:/Program Files (x86)/Apache Software Foundation/Apache2.2/conf/cisco163_kozikfamily_net.ca-bundle"